Despite cold strong north easterlies at the weekend Marsh Fritillary caterpillars were stirring at a site in south west Cornwall. 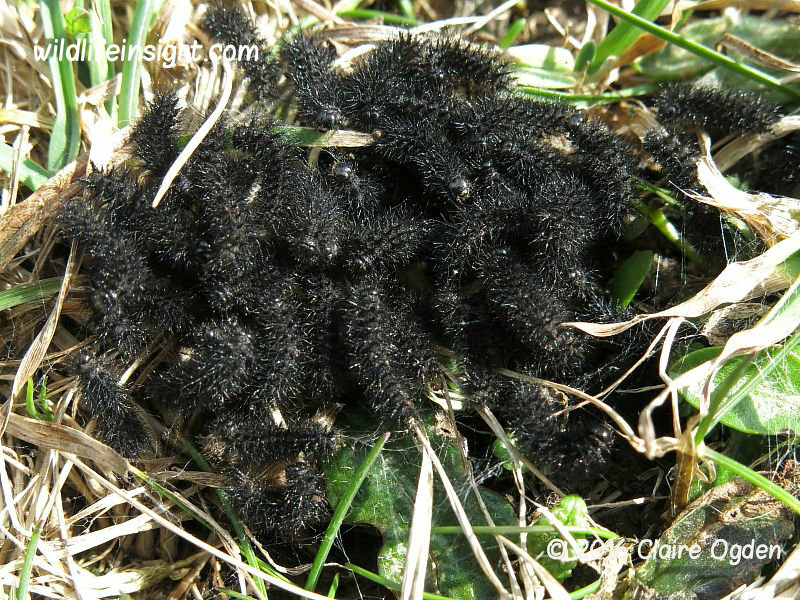 In brief spells of sunshine several webs of larvae appeared on the surface of a sheltered coastal bank. Hopefully there will be many more showing with the arrival of Spring. Please not that due the large numbers of much appreciated photographs and sightings received a backlog of latest sightings updates has built up. But the most interesting will feature in galleries and latest sightings soon. Thank you for your patience. In the Uk in the last few days some of the caterpillars sighted include those of The Red Admiral, The Brimstone Moth, Common Footman, Scarlet Tiger, Large Yellow Underwing, Angle Shades, Square-spot Rustic, Marbled Beauty, Silver Y and Light Brown Apple Moth. Further afield interesting sightings arrived from Israel, South Africa and Australia.